There is an expansive area of old woodland to the west of Bristol quite enchantingly called Goblin Coombe. Moss covered stone lines the sides of the small gorge that cuts through its heart. One side of the gorge you can climb up hundreds of makeshift steps and walk along the cliff edge to be rewarded with, weather depending, a view of the whole valley. The other side of the gorge is dense woodland that gives way to farmland. It is on walking this side that I chanced across a dry stone wall which prove to be an ideal resting stop for the lunch I was carrying. 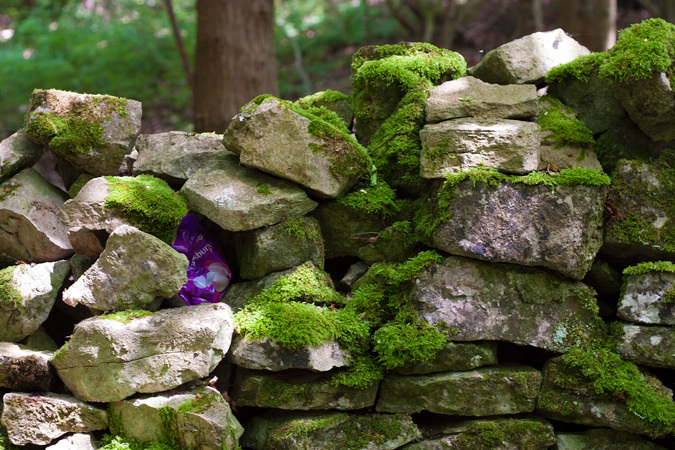 Having sat down and happily eating away I noticed, partially obscured by stones, a pinkish bag buried within the wall. Curiosity getting the better of me I removed the surrounding stones to discover an entire bag of marshmallows. The bag bleached with age was completely intact. The best before date on the side stated 09.2009. This date provided me with enough evidence they had been there for some time, lost and most likely forgotten - the handiwork of some geocacher or someone that had planned to return for a treat one day and never had. Even though they were two years out of date without further ado I decided to tuck on in. Two years later I happened to return to Goblin Coombe. I took with me a new pack of mallows and hid them in the very same spot where I'd found the ones back in 2011.